This holiday is the Balinese New Year called Nyepi, means “to keep silent” and falls on the day after the dark moon of the spring equinox – this year it falls on 9th March. It is a day of total silence for the whole entire island. All routine activities come to a grinding halt, including flights into and out of the island. No one steps out of their homes. Purification and sacrificial rites are held the day before to exorcize evil spirits from every corner of the island. No traffic is allowed on the streets, except emergency vehicles. As a hotel guest, you are confined to your hotel premises, but free to continue to enjoy the hotel facilities as usual. Traditional community watch patrols enforce the law of Nyepi, patrolling the streets night and day. On Nyepi Day, complete calm surrounds the island. An opportunity for relaxation and contemplation. Nyepi Day in Bali is the New Year’s celebration like nowhere else on earth. 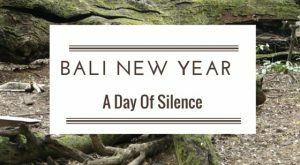 It is also known as Bali’s celebration of the Saka New Year and the Bali Day of Silence, it is traditionally the quietest day of the year. Most Balinese and visitors regard it as a much-anticipated occasion however, many visitors escape Bali for the day due to the restrictions that surround this observance. Always check coinciding dates before booking your Bali accommodation, you may consider avoiding it altogether. It is a special occasion annd Nyepi is worth experiencing since the days preceding and following are vibrant and colourful. Village meeting halls ‘banjars’ and streets feature papier-mâché effigies, ogoh-ogoh, built for weeks leading up to the Saka New Year. Before ‘the day of silence’, rituals usually start three days prior to Nyepi, with colourful processions. Pilgrims from the village temples across Bali convey heirlooms on long walks towards the coast where purification ceremonies take place. As a photographer it is one of the best times to photograph this unique Balinese occasion. On Saka New Year’s Eve, the air is filled with noise and merriment. The Balinese households begin the evening with blessings at the family temple and continue with a ritual called the pengrupukan where everyone participates in ‘bhuta kala,’ ‘chasing away’ malevolent forces,hitting pots and pans or anything to make noise. These ‘spirits’ are later manifested as the Ogoh-Ogoh to be paraded in the streets together with the a few firecrackers.